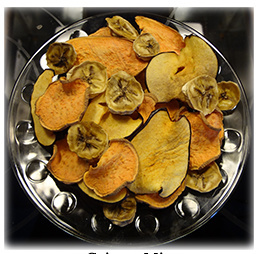 Lacey's Barkery review: tasty homemade treats for pampered pooches! 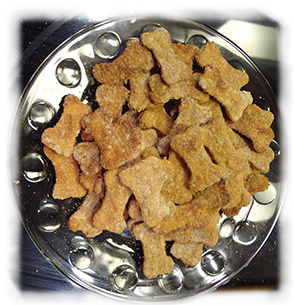 Homemade doggy treats are a great way to show your dog that you care, and also to ensure you’re giving your pup a tasty snack without all the icky fillers and preservatives found in many commercial dog treats. Ideally, we’d all love to make treats for our dog in our own kitchen. Unfortunately, most of us have enough trouble finding the time to cook ourselves a homemade meal, let alone our pooch! Lacey’s Barkery was kind enough to offer Mad About Pets a sample of their most popular baked treat flavor, Peanut Butter and Bacon. We wanted to put Lacey’s to the ultimate test, so we recruited a particularly selective test subject. Meet Amos, the 8-year-old rescue poodle. Amos’ person reports that he does not eat treats; in fact, he has no idea what to do with them. When offered a dog bone at the bank drive-up window, poor Amos just stares at it. Growing up in a puppy mill, Amos never learned the simple pleasure of a dog treat. Even if he wanted to eat a treat, the amount of teeth he’s missing makes it quite difficult. Yes, Amos is a tough test subject indeed! Amos’ person was understandably skeptical about how Amos would react to this “experiment.” Due to his missing teeth, she broke the Peanut Butter and Bacon treat in half and offered our test subject only a small portion. Amos gave it a skeptical sniff, turned tail and walked away. Drat! The experiment was not off to a very good start. Amos’ person left the bit of treat on the floor, in the event that Amos might change his mind. She went about her business, realizing a few minutes later that Amos was nowhere to be seen. She found Amos merrily munching the bit of treat, and cautiously offered him another bit. He ate it! Much to Amos’ person’s amazement, Amos was eating and enjoying a dog treat—something she thought she’d never see. Amos the test dog gives Lacey’s Barkery two enthusiastic paws up! Besides the glowing review from the pickiest poodle in Madison, Mad About Pets loves that Lacey’s donates part of the purchase price to animal charities like AKC Canine Health Foundation and Romania Animal Rescue when you use the appropriate promo code (found at the bottom of this page.) If you’re looking for tasty homemade treats you can feel good about giving your dog, check out Lacey’s Barkery and the full line of great products they have available to spoil your dog rotten! Dog names graphic produced by Matt Beswick for Pet365. Click here to view the full post. 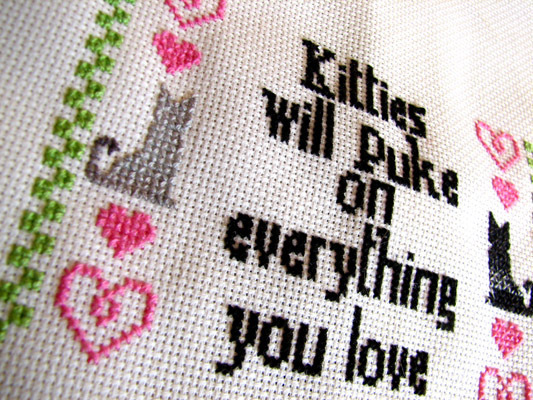 For cat owners, cleaning puke off the carpet is just par for the course. Although some cats rarely vomit, some cats are what many vets refer to as “pukers”. These are the sorts of cats that vomit weekly (or even daily), despite being healthy. To understand why cats puke, it’s first important to understand what exactly puke is. When it comes to cats, not all puke is created equal! The three most common types of feline upchuck are: hairballs, regurgitation and vomit. Let’s start with hairballs. Hairballs are just that…balls (or tubes) of hair that accumulate in the stomach. We all know that cats are fastidiously clean creatures, and of course clean themselves using their tongues. The tongue of a cat is barbed, meaning it has little hooks on it similar to the hooked portion of Velcro. These barbs catch and pull out the dead hair and debris in the coat while the cat is cleaning, and the cat ends up swallowing it. Normally the swallowed hair passes through the body and ends up in the feces, but sometimes the hair accumulation becomes a little too much. The only other place for the hair to go is back from where it came, so the cat ends up vomiting a tube-like blob of hair. Most cats deal with hairballs from time to time, but if it becomes a frequent occurrence the veterinarian should be consulted. Though rare, some cats have been known to get an internal blockage if too much hair accumulates inside. To help avoid hairballs, brush your cat regularly. There are also products available to help lubricate the digestive system and allow hairballs to pass in the feces. Another common type of cat puke is actually regurgitation. This is when your cat vomits up food shortly after eating, and the food hasn’t even had a chance to begin digesting. The cat will not wretch prior to regurgitation; it will simply expel a glob of food from its mouth. Regurgitation happens when food blocks the esophagus, either because the animal has eaten too quickly or the swallowing has somehow been interrupted. Many cats on dry food diets will experience regurgitation from time to time. One simple way to prevent it is to raise your cat’s food dish so it must sit on its haunches when eating. By raising the food dish, the cat will either sit on its rump or stand up while eating. A food dish sitting directly on the floor means the cat will usually crouch down to eat. When the cat eats in this position, the cat’s esophagus must function without the helpful assistance of gravity! As a result, the food will often accumulate in the esophagus without going all the way down to the stomach, and the cat regurgitate. Frequent regurgitation can lead to aspiration of food particles into the lungs and potentially pneumonia. 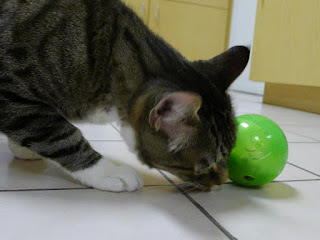 A cat food ball is an easy way to prevent regurgitation. The final most common variety of cat vomit is, well…vomit. This is where the cat wretches and expels stomach contents including bile and partially digested food. Vomit can be an indication of many things including sickness, food allergies, parasites, poisoning, and even eating indigestible things like plastic bags or rubber bands. Cats will vomit from time to time; just like humans, they can become ill and go through short bouts of vomiting or diarrhea. This is generally not a cause for concern, unless there is blood in the vomit or you know the cat has gotten into something it shouldn’t (houseplants, chemicals, balls of yarn, etc.) If you suspect poisoning or ingestion of inedibles, or notice blood in the vomit, contact a veterinarian immediately. A vet should also be consulted if the cat vomits incessantly, appears lethargic/weak, or continues to vomit for a period longer than 8 hours. Frequent vomiting can also be a sign of serious illnesses such as kidney and liver disease, diabetes, or an obstruction in the intestines. When it doubt, it’s always best to check with your veterinarian. Sign up for DoggyLoot and save 75% on treats and toys for your dog! Today I came across a company I think is fabulous! It's called DoggyLoot, and it's a daily email service (similar to Groupon, Woot, or Living Social)...except it's for dog supplies only. You can save up to 75% on things like treats, toys, chews, and more. The best part is, the shipping is always free! When you sign up, DoggyLoot will ask you for the size of your dog so that your deals can be customized to fit your specific pet(s). Your dog will be in heaven with all the great discounted items you can purchase! Check out DoggyLoot and start finding amazing deals for your doggy today! Enter to win a $25 Petco gift card from CouponCabin! In today's current economic climate with job loss and gas prices on the rise, many of us are looking for ways to pinch pennies. Unfortunately, pets are one of the costs that many people can no longer shoulder. Animal shelters are currently filled with pets who were displaced due to their owners losing their jobs, their homes, or both. 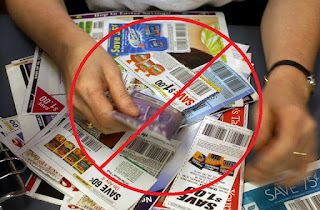 With CouponCabin, no more cutting coupons required! Many people are looking to coupons these days more than ever before to help save on essential purchases, and pet owners are no exception. Thanks to the internet, searching for coupons is easier than ever. 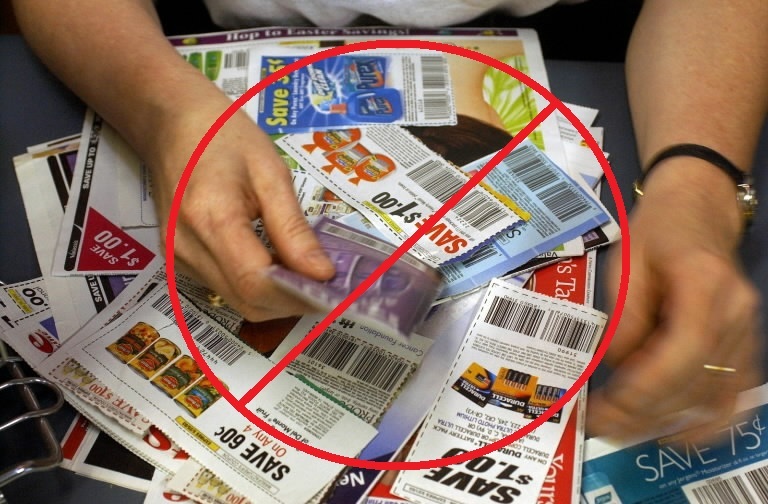 Couponing used to mean digging through stacks of newspapers and magazines and cutting coupons out by hand. Now with online shopping, coupon sites like CouponCabin make it easy to search for, find, and use coupons without ever having to leave the house. CouponCabin.com works directly with Petco and more than 3,700 other retailers to offer incredible savings on quality goods. Their Petco online coupons save shoppers $31.99 on average! Users can grab a code quickly (less than 90 seconds on average), or sign up for CouponCabin Rewards to earn points toward gift cards. Also, CouponCabin just released a mobile app! The CouponCabin Mobile app is available at the GooglePlay and iTunes stores. In addition to the mobile app, they also just launched the CouponCabin iPad app! It really is a single coupon app that does it all! Learn more about having the power of saving at your finger tips at http://www.couponcabin.com/mobile/ . CouponCabin has been featured in The New York Times, The Wall Street Journal, O, The Oprah Magazine, USA Today, Good Morning America, MSN Money, Good Housekeeping and Yahoo! Finance, among many others. CouponCabin and Petco are partnering with Mad About Pets to give away a $25 gift card to Petco. Imagine all the food, treats, toys and cat litter you could buy with that!! All you need to do is leave a comment on this post telling me what you'd buy at Petco if you won the gift card. Please leave a separate comment for each additional entry to state you have completed the requirement. I highly suggest that you leave your email address in your comment(s) so that I am able to contact you ASAP if you're the winner. If I cannot contact the winner within 3 days, I will have to draw a new winner. The giveaway begins today and ends at 11:59 Central Time on August 30, 2012. I'll then be drawing a random winner from all the entries. Disclosure: I received no compensation for this post and the opinion stated here is that of my own. I was not influenced in any way. By entering this promotion, each participant agrees to release, indemnify and hold harmless the Sponsor and its parent companies, affiliates and subsidiaries and their respective representatives, officers, directors, shareholders, agents and employees from and against any injuries, losses, damages, claims, actions or liability of any kind resulting from or arising from participation in this promotion. "Potty training"...the two words that make many dog owners cringe. It seems like some dogs take to potty training like a fish to water, while others require a long and difficult period before the concept makes sense. Even when a puppy is fully potty trained, owners still must deal with the early-morning and late-night potty breaks, and occassional accidents on the kitchen floor. Wouldn't it be convenient just to have an indoor dog bathroom for your dog that he could use whenever the need arises? Believe it or not, you CAN: it's called the Potty Training Puppy Apartment! The Puppy Apartment is a unique new potty training device that combines the best parts of the many different training methods on the market. Puppy training pads seems to be the most popular product for indoor potty training, but unfortunately many dogs "overshoot" or miss the pad entirely (leading to sticky, not to mention stinky, floors.) Indoor grass patches have become popular, but the same problem exists with overshooting and the obvious inconvenience of having a box of grass/faux grass in your home. These solutions aren't viable, either, if your dog or puppy is confined to a crate during the day. Older dogs will be expected to "hold it" until you get home. However, puppies have tiny bladders and therefore must take frequent potty breaks; if your puppy is confined to a crate for more than a few hours, accidents can and WILL happen. The Puppy Apartment combines a crate and a bathroom so your dog has access to a potty area and a sleeping area, yet in separate compartments to keep your puppy clean and comfy. The best part about the Puppy Apartment is that it comes with a training DVD to teach you exactly how to use the device with success. The Puppy Apartment training program teaches the dog to use the bathroom indoors in 3 stages, so the puppy gradually learns to use (and prefer) pottying indoors in the Puppy Apartment. Eventually, your dog will be able to have free reign of the house and still will go back to the Puppy Apartment to potty (like his own personal bathroom!) The training program was developed over a period of five years of research, and is even patent pending. Customer service is also available 7 days a week to help with any questions or concerns that might come up with the Potty Training Puppy Apartment, so once you start you always have help available if you need it. Many owners like to crate train their dog, but this can come with the issues discussed above (older dogs being forced to "hold it", and puppies requiring frequent potty breaks.) The nice thing about the Puppy Apartment is that it can be used to crate train and potty train simultaneously. Since the Puppy Apartment is divided into two separate sections, it is a combination bathroom and bedroom (sort of like a studio apartment for dogs.) Your dog will always have a clean and dry place to rest in the crate, and a bathroom available when he needs it. Dogs that stay crated during the day will be sure to enjoy this! Dogs who will have free reign of the house (after potty training) will also appreciate having an indoor bathroom to use. Dogs are biologically wired to seek a den to dwell in (like their wolf relatives), so having a crate available to rest in is a great idea even for dogs who are not confined to a crate for long periods of time. The Crate Training Puppy Apartment fulfills the need for a den dwelling and a bathroom in one unique product. If you're looking for an effective way to potty train your puppy or dog, or a nice alternative to taking the dog out at 6 AM every day for a potty break, check out the Potty Training Puppy Apartment. 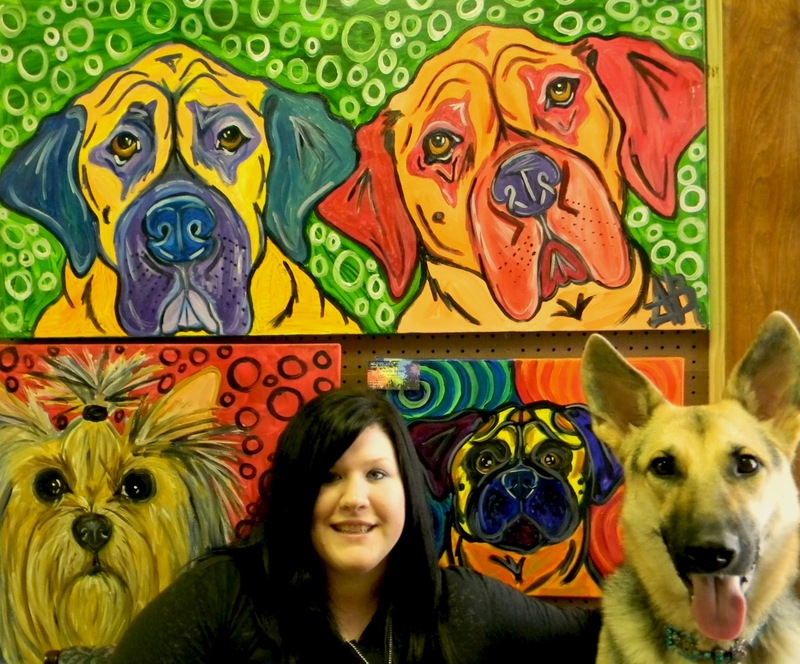 The artist and her loyal German Shepherd, Truda. Alicia Banks of Texarkana, Texas sees pets in a whole new light. Bright, bold, vibrant colors make pets come alive in her unique pop art pieces custom-made for pet owners. Working under the name AB Pop Art, Alicia creates art that not only memorializes treasured pets, but turns them into models for kitschy and fun art that will liven up any decor. Ms. Banks was kind enough to grant Mad About Pets an interview about AB Pop Art, and offer some insight into her creative process. 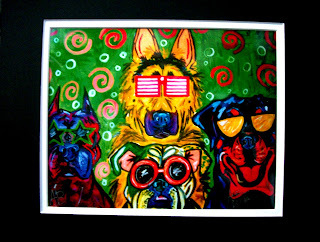 (Alicia Banks) I choose to paint pets over any other subjects because I have always loved animals, dogs in particular. Before I started selling my artwork all I would sketch and paint were animals. Growing up I would always bring home abandoned animals or animals that needed to find a good home (dogs, pot belly pigs, a turkey named Lucky Tom, turtles and so on.) I also worked as a vet tech and I have been a groomer for the past 7 years, so I have always worked with or around animals my whole life. Why not paint something you absolutely adore? I see that you paint with watercolors. Why is that your preferred medium? The reason I chose watercolors as my medium is because they are easy to blend. Everyone always asks me why not use acrylic; honestly, I have never worked with acrylic. If you were to look at my paintings you would never even know they were watercolor paint, they look exactly like acrylic because I paint the colors on so thick. Do you have a favorite type of animal to paint? My favorite type of animal are dogs, I have never owned a cat but I do enjoy painting them as well. 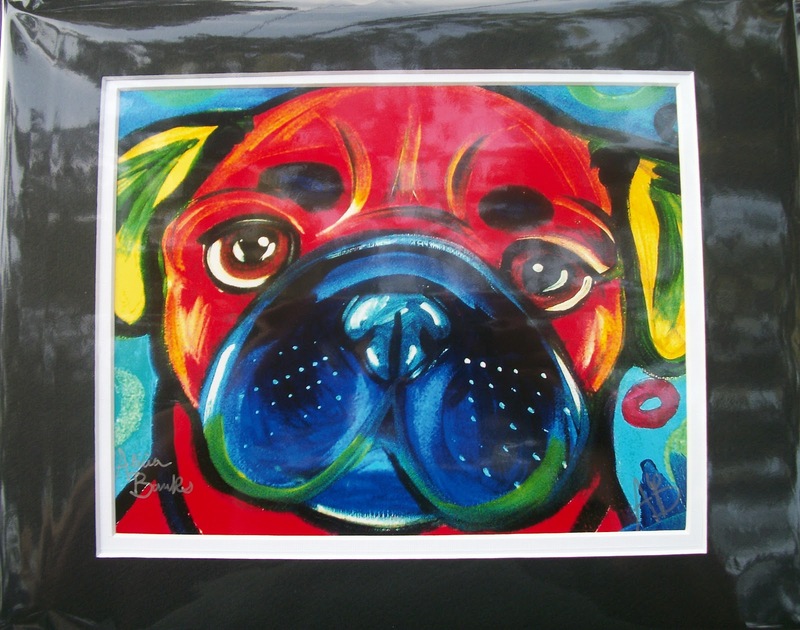 My favorite breeds to paint are German Shepherds, Great Danes and English Bulldogs. Your paintings are very bright and bold. Is there an artist whose style you most admire, or who has influenced your work? I have always admired Andy Warhol-- his bold and vibrant colors always put me in a happy mood. Another artist that I admire is George Rodrigue. 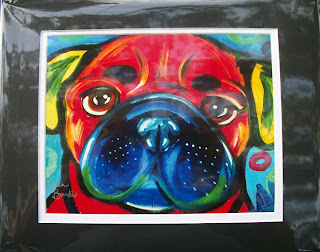 Even though he only paints the same "blue dog", he uses a ton of colors like me. I actually follow his wife Wendy Rodrigue's blogs and soak up every bit of what she writes about him. Do you have any pets of your own? If so, how do they inspire you? I own a German Shepherd named "Truda"; she is a little over a year old and has been by my side from day one. She is a big part of my life and my inspiration. 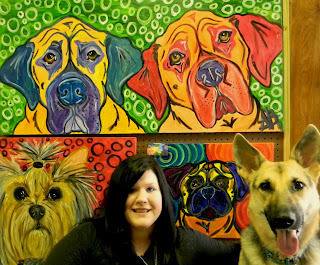 I have painted a few pieces that she is included in, one being "The Gang" which features a German Shepherd in the middle, a Rottweiler to the right, Pit Bull to the left and an English Bulldog in the lower bottom of the painting. I was inspired to create this painting because when my husband and I were searching for places to live here in Texarkana, every place had a breed restriction list. These four breeds were usually on every list! It actually made me more upset than anything, so I created in my own mind that these were the coolest breeds. Yet they were banned from everywhere! That's how "The Gang" was thought up . I even added sunglasses on them to make them look even cooler. Is there a painting of yours that you are particularly proud of? I am really proud of all of my work because every painting that I paint has a story, but one in particular would be a baby Pug that I painted for a friend of mine named Karen. She worked with my mother for several years and had one of the biggest smiles that would literally light up a room. Karen was very ill from fighting lung cancer and asked my mother if I would paint her sister's dog for her. I was thrilled to do this for her. I finished the painting and by the time it got there, Karen had already lost her battle. But I know that it will always be treasured by Karen's sister and her family. If you are interested in a piece from AB Pop Art or would like to see more of Alicia's work, please check out the website and Facebook page for examples, pricing and contact information. Why does my cat smell something, then open his/her mouth? We cat owners have all seen it...you’re laying on the couch, minding your own business, when the cat jumps up and takes a big whiff of your feet. 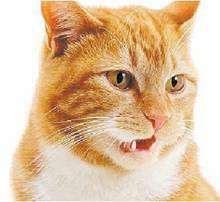 Your cat then opens its mouth and grimaces as if your feet are the worst smell it has ever encountered. Really makes you feel self conscious, doesn’t it? A cat exhibiting the flehmen response. When this happens, you are seeing your cat’s Jacobson’s Organ (or vomeronasal organ, if you want to get fancy) in action. This organ is located on the roof of the mouth right behind the front teeth, and is connected to the nasal cavity. Many types of animals actually have this organ, even insects and reptiles. There are several theories about the use of the Jacobson’s Organ, but the most common theory is that the organ helps to sense pheromones and chemical compounds. Your cat accesses this organ through the “flehmen response”; this is where the cat opens its mouth and literally inhales the scent. The Jacobson’s Organ is just another amazing way our cats become familiar with their surroundings, locate suitable sexual partners, and avoid danger. Why do cats use a litter box? The litter box: one of the best and worst things about owning a cat. Cats are great because they go potty in a box, and don’t have to be let out several times a day to “go.” Of course that means there is a box in your house full of cat waste. It can be a pain to keep the litter box clean, but still…it’s better than waking up at 2:00 a.m. to let the cat out! Your child's sandbox is the ideal "litter box" for feral cats. But why exactly do cats use a litter box? Well, it all goes back to before cats were domesticated. By burying their feces, cats break the scent trail and protect them from predators. It’s much easier to dig in sand or loose dirt than digging a hole in the regular soil, so they naturally gravitate towards those easier digging spots. Ever notice that feral cats will seek out a child’s sandbox to use as a litter box? Naturally indoor domesticated cats will seek out a place that is easy to bury their waste, and the best choice for them is the litter box. They prefer a finely ground litter that resembles sand, which is why fine grained clay litters tend to be the most accepted litter choice for cats. In the “wild”, cats urinate and defecate in different spots. For this reason, it is always best to have 2 litter boxes in a single cat household. You may find that your cat prefers to urinate in one box, and defecate in the other. This is a call back to natural, wild behavior. In a multi-cat household, the rule of thumb is “1 box per cat, plus 1.” So if you have 3 cats, you should have 4 boxes. 4 cats, 5 boxes. And so on. Mother cats teach their kittens how to potty properly. 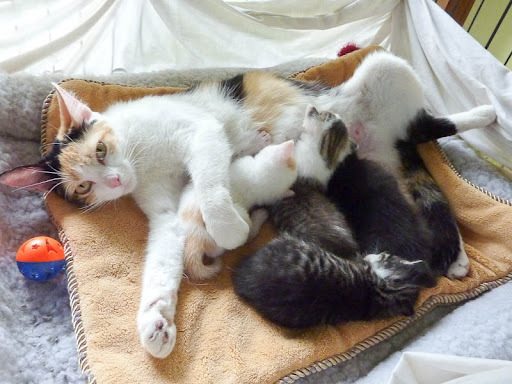 Most cats are taught by their mother how to properly bury their waste and where to do it, but some kittens raised from a young age by humans may have missed out on mom’s lessons. In that case, simply placing the kitten into the litter box after meals, play sessions, and other rigorous activity should be sufficient to potty train the kitten. The natural desire to ward off predators is in a cat’s very DNA, and they will naturally be inclined to use a litter box when provided. Always remember, though, that cats are impeccably clean creatures. As such, they require a clean litter box that lives up to their standards. Try your best to scoop the litter box at least once per day, and sanitize the box frequently to get rid of the ammonia build-up from urine. Why does my cat slowly blink at me when I look at him/her? refrain from staring at me. 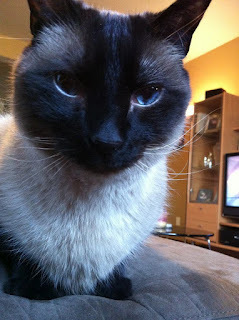 The eyes are another aspect of our cats' complicated body language. To directly stare at a cat is considered a threatening behavior. Think about it, though…doesn’t it make you uncomfortable and a little creeped out when someone stares at YOU too long? Sometimes the cat may look away if you stare it directly in the eye. Sometimes it may continue staring back at you, unwavering. But sometimes, the cat may slowly blink at you. The slow blink is body language stating, “I am not a threat to you.” As a cat owner, you may find your cat staring intently at you from across the room. If you slowly blink at the cat, it will probably blink slowly back at you. By slowly blinking at the cat, you are giving him the message that you are not a threat. By blinking back at you, your cat is telling you, “Hey, neither am I. I’m pretty comfortable here.” Cats also use the slow blink with other cats to break up an aggressive stare down. Some behaviorists use the “slow blink” trick when meeting new cats. It can be a way to “break the ice” with the cat, showing her that you are not a threat. To be honest, the best way to show you are not a threat to a cat is to not stare her in the eye to begin with! Though the cat may slowly blink in submission, staring the cat in the eye IS a threatening gesture, and most cats respond better if you simply look past them or off to the side. Ever notice that someone who dislikes cats seems to be the most attractive person to a cat? That’s because people who dislike cats tend not to pay them any attention, and that (in feline language) is a non-threatening gesture and an invitation for further contact. For “cat haters”, it’s almost a catch 22. The best rule of thumb? Never stare a cat directly in the eyes. It’s just not nice. Have you ever watched the Westminster Dog Show and realized just how many dog breeds you're NOT familiar with? Personally, it seems like I am learning about new breeds all the time. Here are some of the most unique and unusual that I've encountered. 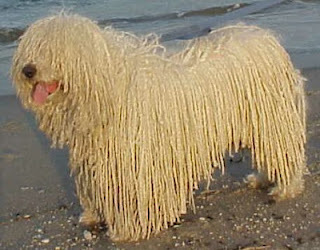 You may recognize the Komondor from the cover of Beck's 1996 album Odelay. ﻿The Komondor has a unique corded coat, basically the equivalent of dreadlocks! Komondor puppies are fuzzy and soft, and it takes about 2 years for the undercoat and outer coat to lock up into the characteristic cords. The breed is a highly effective livestock guardian, and the corded coat is thought to protect against bites from prey animals like wolves. Is it just me, or does this breed look like it belongs in an 80's glam rock band? 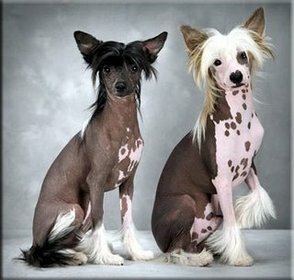 The Chinese Crested is a mix of hairless and long-haired, with a naked body and tufts of fur on the feet, tail and head. Having 2 types of coat means double the grooming needs. The naked skin needs to be treated like a human's, and can be prone to the same sorts of problems like acne and sunburn. The furry parts can matt easily, and as such need to be brushed and combed frequently. The amount of fur varies from dog to dog, and some dogs in a litter of Chinese Crested may be born with a full, long coat and almost no hairlessness whatsoever! The Peruvian Hairless dog is a very old breed indeed, documented by the Spanish in the 1500's and exhisting well before that time. The dog is considered a hairless dog, though it can have small amounts of hair on its body (particularly on the head and tail.) Many of the dogs sport a rather fashionable mohawk! The skin can come in any color from pink to black, and mottled with any color in between. 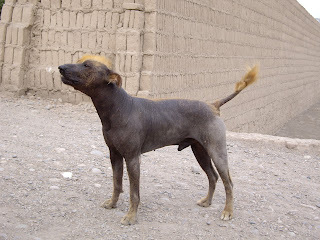 Peruvian Hairless Dogs (or Peruvian Inca Orchids as they're sometimes known) in America tend to all look rather similar, as they are bred from a small breeding pool of imported dogs. However, the breed tends to be more variable in its native South America. It is a fairly small dog, ranging from about 25-50 pounds (though sometimes smaller.) Extra care needs to be given to the skin to slough off dead skin cells, and the skin should be protected by sunscreen when the dog is in the sun. At first glance of a photo, it is hard to see anything unusual about the Klee Kai. It looks just like a regular Husky, right? Well, yes AND no. 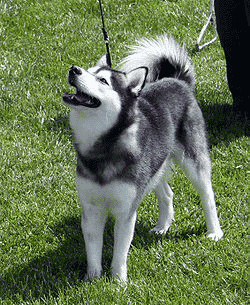 Though the Klee Kai may look like a common sled dog, it is actually a miniature version of the Husky! The Klee Kai looks more-or-less like a Husky puppy that never grew up. The adult height is between 13-17 inches (for comparison, that's about the size of an average Beagle.) The Klee Kai retains the same personality and active lifestyle as other sled dogs, but it's all packed into a tiny little package. The breed was released to the public in 1988 and is a member of the American Rare Breed Association and United Kennel Club. 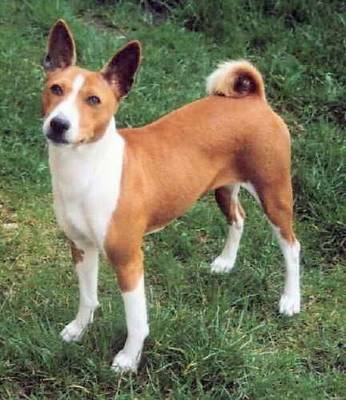 ﻿The Basenji is a unique breed not because of what you see, but what you hear...or rather, what you don't hear. Considered by many to be the most silent breed of domestic dog, the Basenji simply doesn't bark! It is nicknamed the "Barkless Dog" for this reason. Though it may be considered "barkless", it's not entirely silent. It has a characteristic yodel and makes other unusual noises. Some theorize that the unusual vocalizations come from a selective breeding of sorts. The dog originates from Central Africa, and it is possible that louder dogs with a more traditional bark were killed to keep human villages safe and less visible to rival neighboring tribes. Whether or not this is true, the unusual sounds are biologically caused by an unusually shaped larynx.